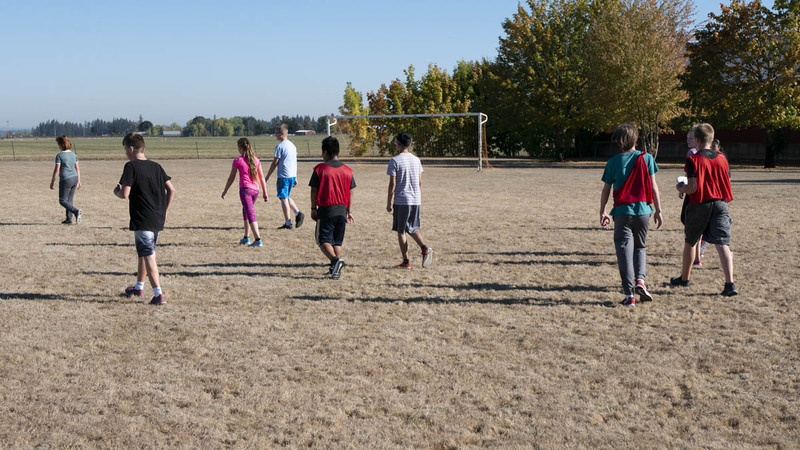 Student at Butte Creek School enjoy a large campus in the country, which means plenty of room for Ultimate Frisbee during PE! On a recent trip out to this largest K-8 school in the district, middle school students spent their physical education time outside, enjoying some of the last of this years’ warm weather. Meanwhile, younger students were in their classrooms, still getting to know their teacher and new classmates. In Ms. Kuenzi’s Kindergarten classroom, students were treated to music from the guitar followed by group recitation of classroom expectations. Because honestly, what isn’t improved by the addition of an acoustic guitar? Spend five minutes at Central Howell School and one thing becomes obvious – students are engaged in their own learning. In several classrooms at this K-8 school on the road between Silverton and Salem, students nearly bounced out of their chairs at the opportunity to answer a question, volunteer to be a helper, or share a story from their summer. Activities varied wildly between classrooms for the elementary school students in particular, who we saw coloring between the lines, identifying numbers, and focusing on their reading skills. The common thread was in the level of interest and engagement their teachers had cultivated even in these first weeks of the school year. Evergreen School houses fewer than one hundred students in just a few classrooms in a single rustic building. But don’t let this quaint little school fool you – within those walls students receive a modern education, and it’s a family affair.